Before you can transfer your domain name registered with Tucows to us, you need to prepare your domain name so it will successfully complete the transfer process. If your domain name is not registered with Tucows, visit Transferring Your Domain From Another Registrar for instructions for other registrars. 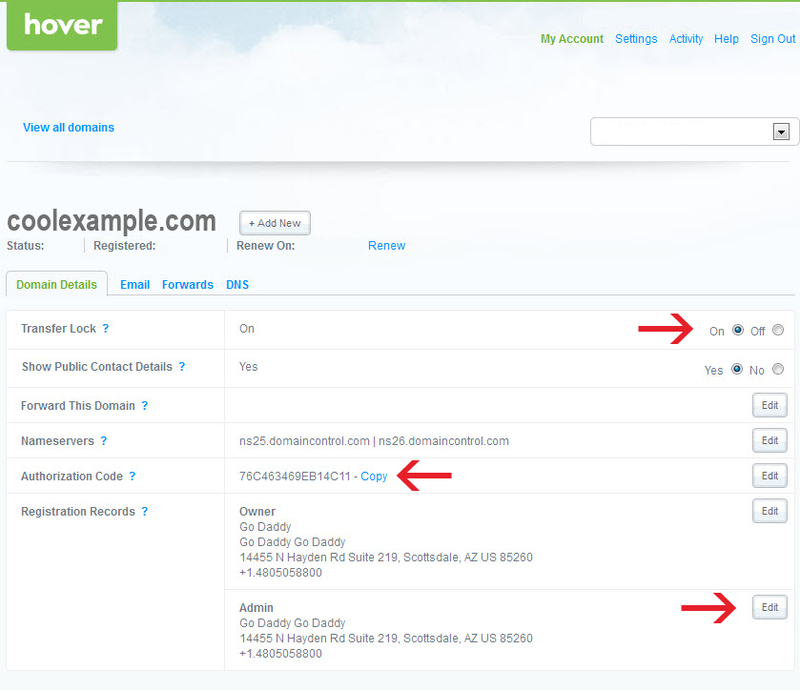 Note: Hover is a domain name registrar division of Tucows. The domain name has been registered for at least 60 days, and has been with Tucows for at least 60 days. The domain name contact information hasn't been changed within 60 days. Note: Some registrars prevent domain names from transferring away if the contact information associated with a domain was updated within 60 days. Get an authorization code (also known as an EPP code or transfer key) from your current registrar, if required. Some domain name extensions, primarily country-code top-level domain names (ccTLDs), do not require an authorization code. Log on to your domain name at https://manage.opensrs.net. You'll find the authorization code is in the Domain Extras section. If Domain Locking is enabled for your domain, you must contact your Tucows reseller to have the lock removed. The lock must be removed and the registry status verified as “Active” before you can request a domain transfer. Note: It may take 24 hours before our system identifies and recognizes the domain status change. Ask them to unlock the domain name. Purchase a domain name transfer from our website. If the extension you want to transfer is not listed, you cannot transfer the domain name to us. Keep the existing nameservers... — If you have a hosted website for your domain name (with us or another company), select this option to ensure that your site does not go down during the transfer. Change ... to park nameservers — If you have email with us for the domain name, are using our Off-site DNS, or created a DNS template prior to the transfer, select this option. For more information, see Manage DNS zone files for your domain registered at another company and Creating Transfer Templates in Premium DNS. When you have successfully prepared your domain name to be transferred, see Transfer my domain to GoDaddy for information on completing the domain name transfer with us.